I expected this week to be rather quiet as far as investing goes, but the markets don't wait for anyone. Tuesday offered up some good opportunities to close some of my open option positions as well as open up some others. Let's cover the ones that were closed first. Altria, like many of the higher yielding dividend growth companies, experience some volatility right at Trump was elected President. However, cooler heads have prevailed, at least regarding Altria, and the share price has continued to climb higher. 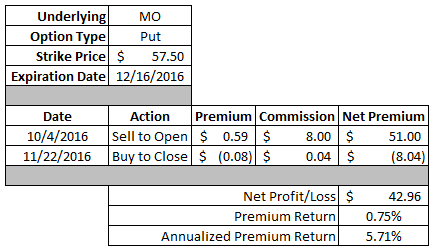 I originally sold to open a put option on Altria back in early October with a $57.50 strike price that was set to expire on December 16th. With the share price climbing higher over the last few weeks that means the price of my out of the money put option went down. Don't worry that's actually a good thing when you've sold a put option. Yesterday, I bought the put option back to close out the position. When I wrote the put option at the beginning of October I was secretly hoping that it would be executed. That goes against my current strategy of using options to generate extra income; however, the effective purchase price would have been on the high end of where I would be willing to buy shares of this wonderful company (morals/ethics of the business notwithstanding). My net profit worked out to $42.96 or 0.75%. On an annualized basis that's a 5.71% rate of return. Currently the share price is over $64 so it's a bit too far out of the money to make it worthwhile to sell another put option on Altria at this time. However, if Altria does dip back down to around $60 there will likely be adequate strike/premium combinations to allow me to go back to this well again. And who knows, maybe the next one will execute and I'll get a chance to finally add shares of Altria to my portfolio. Tuesday brought about the opportunity to close out one of my more recent put options moves. I don't normally aim to close out put options just a week after writing them, but if the markets work with you you don't fight it. Like the Altria put option I was pretty ambivalent as to the outcome of this put option. Either way it worked out was just fine by me since it would have allowed me to buy shares at nearly an 8% discount to the share price when the option was written or generate almost a 17% premium yield. That's why I think put options, when done correctly, can be a best of both worlds scenario. While I didn't really care how this trade turned out, I have to say it worked out perfectly. The share price dipped the day after I opened the position after Lowe's reported earnings causing me to lose out on some of the profit potential; however, since then it's rebounded up over $71.50. What really made this a great trade is that the share price rebounded quite quickly allowing me to close out the put option in a short time. I was able to capture 80% of the potential premium in just 16% of the days to expiration. My net profit on the put option worked out to $99.91 or 1.54%. On an annualized basis that's a solid 121.65% rate of return. Now we move over to the two new put options that I opened up on Tuesday. If you remember last week I was able to both open and close a $77.50 strike put option on Visa for a nice $113.91 gain. Well I went back to that same well again yesterday under very similar circumstances as last week. Visa's share price sold off over 2.6% on Tuesday which sent me looking for a potential reason. Like last week there was no real news that I could find that could have led to a fairly sizable one day decline in an otherwise boring day for the markets. So I went scouring the option chain for new put possibilities. There weren't any great deals on the options market that fit my normal target of a 10% discount or a 10% premium yield so I strayed a bit from my normal strategy with this move. If the share price of Visa falls below $78.50 then the put option would move "in the money" and could be executed. If executed I would be forced to purchase 100 shares of Visa for the strike price ($78.50) less the premium received ($103.95/100) or $77.46. That's not ideal as it doesn't provide much downside protection. The valuation would be a bit stretched too with a P/E based on 2016's earnings at 27.8 and on 2017's estimates it would still be 23.5. If the share price remains higher than $78.50 then I'll get to keep the option premium as profit. Based on the capital at risk that would represent a decent 1.32% return in about 3.5 weeks or 22.2% on an annualized basis. While I drifted away from my normal 10%/10% strategy with put options I'm still okay with either way this works out. Ideally the share price would move back higher over the coming week allowing me to buy back the option and close the position early. If the shares happen to be put to me then I'll just turn around and sell covered calls since this put option doesn't give me an ideal entry point. This put option is very much a short term trade with the hopes of locking in a profit in a relatively short time. Medtronic's share price sold off hard yesterday when they announced a strong earnings report, but issued weak guidance. Revenues had a slight miss to analyst forecasts while earnings eeked out a $0.01 beat. Overall it was a solid quarter with total revenues up 4.1% with every segment showing growth. Net income +114%, non-GAAP net income +6%, EPS +122%, non-GAAP EPS +9%, Operating cash flow +61%. What's not to like? Well, guidance came in with revenue growth being guided down to mid single digit from upper half of mid single digit. Management expects non-GAAP EPS to show double digit growth for FY 2017 and free cash flow of $5-6 B. In my view it was a solid quarter with slightly disappointing guidance, but the over 10% selloff from the previous close to the intra-day low was not warranted at all. If the share price falls below $73.50 then I'll have to buy 100 shares of Medtronic for the strike price ($73.50) less the premium received ($154.95/100) or $71.95. With the share price currently at $73.60 pretty much all of the downside protection is provided via the option premium. Although, I think there's a bit of built in downside premium due to the massive 8% drop in this excellent company yesterday. At an effective purchase price of $71.95 the yield on cost would be 2.39%. The valuation would be attractive as well with a 2016 P/E at 16.5 and a 2017 P/E at 15.7. Medtronic's fiscal year ends at the end of April so fiscal year 2016 is already in the books. If the share price remains higher than $73.50 then I'll keep the option premium as profit. Based on the capital at risk that would represent a 2.11% return in just over 3 weeks or a whopping 37.37% annualized return. 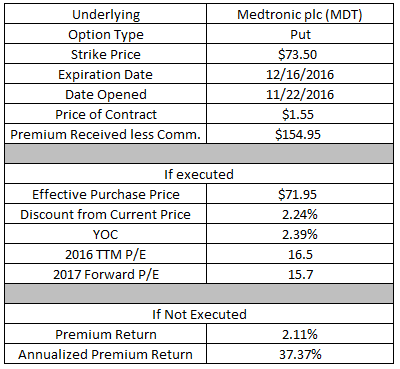 If I didn't already own some shares of Medtronic in my FI Portfolio I likely would have at least initiated a position at these prices. This one was similar to the Visa put option in that I was fine not requiring much downside protection with the plan to be more of a short term trade anticipating a higher share price over the coming week or so. The worst case scenario is that I buy shares of this Dividend Champion at a discount to its intrinsic value. That's not exactly a bad thing. As a little bonus if the shares are put to my I might be able to capture the next dividend payment in early/mid January. Medtronic has yet to announce the next payment; however, based on the last few years the ex-div for the upcoming payout has been late December. Overall I'm pretty happy with the 4 different moves that I made. I was able to close out 2 put options at a net profit over $140. The 2 put options that I opened are a bit out of my normal zone of requiring somewhere around a 10% discount or a 10% premium yield; however, I entered both of them knowing this and with the intention of closing both prior to the expiration date. However, if you recall my Target Corporation (TGT) went horribly wrong when the share price inexplicably jumped 8%...in one day...a week from expiration...past my strike price. Since I rolled that call forward the trade is technically still open. If we ignore all portions of that trade then the net profit for November jumps over $450 with the total for 2016 climbing to $515. Within my Rollover IRA I'm potentially on the hook for just under $53k worth of purchases via put options. That's brushing up on my hard limit of 50% of assets from my Rollover IRA being used for options so I don't expect too much more activity until some of my open positions expire or are closed. I do have my eyes on a couple positions including the aforementioned Lowe's and Altria as well as V.F. 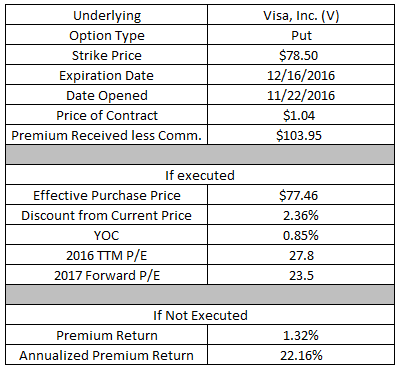 Corporation (VFC) and Unilever plc (UL) as potential option plays if I can find the right expiration/strike/premium combinations. 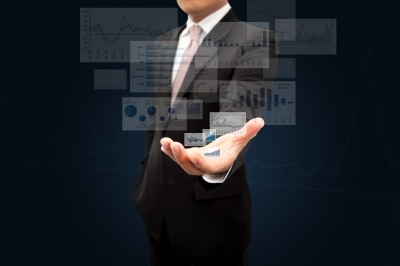 Do you sell put options to generate additional income with your investment capital or purchase shares at a discount? What do you think of my 2 closed and 2 new open puts? I would like to try my hand at options but I just know whatever I touched would implode! I'm glad you're making out okay even with Target going nuts. I love to see options spreading across the blogosphere. You've been busy. I wouldn't beat yourself up about the MO trade. A $2.00 a pack California cigarette tax increase did a number on tobacco stocks. I almost sold the exact same Visa contract as you yesterday, but I decided to wait out the weekend and see what Monday holds. I did the same thing you did with V, but with a VFC trade earlier this week. I sold the contract on Monday and closed for a profit on Tuesday. It feels good when trades happen like that. Best of luck with your open contracts. Good option activity that you have going. Keep writing puts.